Gromit Unleashed! Features about 80 giant, five-feet-tall fibreglass sculptures of the world's most popular animated dog, which have now been "unleashed" onto the streets of Bristol and surrounding area up to September 8. 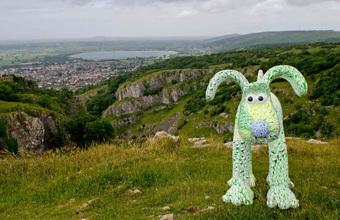 Cheddar Gorge's Gromit features local artist Tom Berry's striking "aMazing Gromit!" design, with a leaf maze that will allow visitors to navigate their way around the sculpture from the starting point on his right ear, through the forest, and to the safety of the cottage on his tail.